Top aide to Ahmadinejad who heads Iran's official news agency arrested for publishing material offensive to Islam. A top aide to President Mahmoud Ahmadinejad who heads Iran's official IRNA news agency, Ali Akbar Javanfekr, was arrested and jailed on Wednesday, IRNA reported. Authorities also closed Iran's leading moderate newspaper, Shargh, after it published a satirical cartoon seen as insulting war veterans, according to the website of state broadcaster IRIB. Javanfekr was detained as Ahmadinejad was delivering a speech at the annual UN General Assembly in New York, IRNA said. It said Javanfekr was taken to Tehran's Evin prison, apparently to serve a six-month sentence on charges of publishing material offensive to Islamic codes and public morality that were upheld by an appeals court in February this year. His lawyer at the time said the charges stemmed from an article in a state-run magazine under Javanfekr's control that was critical of Iranian women being compelled to wear an Islamic headscarf. Javanfekr also fought separate charges of allegedly insulting Iran's supreme leader, Ayatollah Ali Khamenei, on his personal website in April 2011. 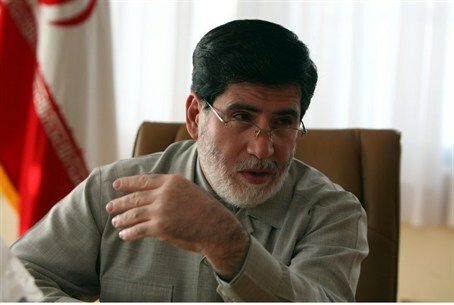 Javanfekr, who runs a state press group that prints several newspapers and magazines, is a media adviser to Ahmadinejad. He has long been targeted by hardline judges and ultra-conservative figures who see him and the president as trying to undermine religious principles they uphold. The Fars news agency reported that a statement from the Tehran prosecutor's office read, "Ali Akbar Javanfekr, who has been previously convicted on two counts, was arrested on Wednesday evening to serve his jail term. "He has been convicted of insulting the supreme leader, publishing material contrary to Islamic codes and public morality, and has also been deprived of any media activities." Javanfekr's incarceration comes days after authorities also imprisoned the son and daughter of an influential former president, Akbar Hashemi Rafsanjani, who is seen as a moderate voice in the regime isolated by hardliners. Meanwhile, authorities ordered the closure of the Shargh daily over a cartoon showing a line of men blinded by headbands slipped over their eyes leading each other. The image appeared to be a satirical comment on soldiers blindly leading each other towards conflict -- presumably related to the military tensions weighing on Iran from Israel. The depiction recalled the headbands worn by Iran's soldiers during the 1980-1988 Iran-Iraq war, an event revered by the Islamic republic's powerful Revolutionary Guards. The culture ministry office responsible for Iran's domestic media said, via IRIB, that after reviewing the cartoon by Shargh, the country's media watchdog "ordered its closure and referred the case to court." In his speech to the UN on Wednesday, Ahmadinejad accused the West of nuclear "intimidation". Prime Minister Binyamin Netanyahu addressed a letter to the citizens of Israel Wednesday night, just before he boarded a flight to New York. In it, he castigated the UN delegates who chose to remain in the UN General Assembly hall as Ahmadinejad spoke.